For grandma's birthday, I want to give her a game. She likes gaming, but she finds many games very confusing. She enjoys Yatzee, Skip-bo, Rummy, and Triomino with her friends. 1) She likes gaming and would surely appreciate a game gift that she likes. 2) I like none of the games among her favourites and I would like to play with her and actually enjoy it. So I need to give her a game we both like. 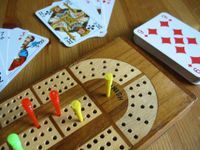 The game should play 2 players as well as 3 or 4 (ideally even more, but 4 is fine), because games are social events and the rest of the family might join in. Here is a short list about what I have tried so far and how it went. There also are some games I thought about but decided against. Please add games you would recommend. Thank you for your help! Feel free to add stories and comments on your own similiar experiences. Thank you all very much so far! Your input is very very helpful! I have now dedided that it is going to be Qwirkle. You have overcome my doubts, so I re-read the rules and I am now sure that Qwirkle is a good idea. Most of the other games on this list are now on my to-try list. Many inspiring ideas there. 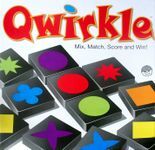 Again: Unfortunately, it look as if Qwirkle does not work too well. Its mostly an issue with colours, but also with the tile-laying and scoring mechanics. See here. While it worked ok, grandma did not find this game very exciting. I am not quite sure why she did not enjoy it, but maybe it was the theme. I think it is also possible that the king as a dummy player confused her. I think grandma was confused by the options and by the concept of scoring victory points in different ways. She nearly fell asleep and was very uncomfortable with the trading and ressource management aspect of the game. Rules-wise, this probably was overwhelming. 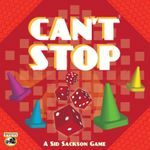 Unfortunately (or maybe fortunately, as I do not enjoy vanilla Carcassonne too much) this was not a hit at all. Too many options, too many different ways to score points and player interaction strategy was not obvious enough. I was sure that Qwixx would be a very good game for her, as she likes Yatzee so much. Not so. Two colours going up, two colours going down turned out to be confusing, as was calculating the different options of using the dice. I think she also might have a problem with keeping the colours apart (the table we play at - unfortunately - is not very well-lit and that is not going to change.) She finally more or less understood the game, but it was too slow to be fun to her. Qwixx is a relatively quick (pun...) game and needs to be played as such. This was quite a hit. Grandma enjoyed the puzzle solving aspect a lot (she also does sudoku). This game works very well for her, but it only plays two players. 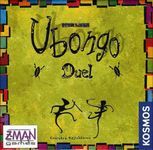 Is the big Ubongo game a good option? Or does it add potentially confusing stuff? 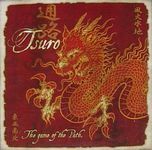 Maybe Tsuro or Tsuro of the Seas would fit the bill? 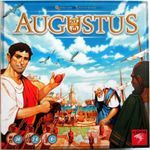 It looks good, has no complicated rules, and can be played with 2 to 6 players. My parents took a liking to this one, the rules are quite simple and it doesn't take very long (so no big deal if you're eliminated in a round). I've never played with 2, so I don't how well that works. And this one went over very well as well - they even tried to find a copy of this on their own. Again, simple rules, but this one has quite a bit of strategy. My sister thought that Qwirkle would be a good game for grandma and I did initially agree. But then I did get to play Qwirkle last weekend and I came to think that it has a lot of potential pitfalls. Adding tiles is not very intuitive if you are starting a new line from a single tile already connected. Nearly everyone seems to think that you can then als build a new line alongside the alread existing game, which you cannot. And then scoring is different from laying out tiles and you must watch out what you can connect and what you cannot connect. It was astoundingly hard to explain this game in a way that the other three people (aged 17, 58, 63) did understand. And we managed to build a few things we later realized were not legal. It does not help at all that the colours are a bit hard to tell apart. Its probably not a grandma game. I told my sister and she said that the friend who she was playing it with mentioned that they were playing in a way „a bit different from whats in the rules book“. I fear this might be a can of worms. Excellent game for all ages and abilities. In another item you mentioned that grandma likes puzzles. Each turn is very much a puzzle trying to figure out what the best clue to give might be (or if you should give one at all). You keep track of the book-keeping (which is hardly worth mentioning) and let grandma focus on the game. Being a Coop is great, because you are all in it together! I know that its a broad generalization that all elderly people like bingo. If your grandma happens to fit in that category, she may like this game. Sorta like bingo just more board-gamy (it is a very light game). It difficult for some to see individuals with poor eyesight the icons are a bit small. The scoring system may confuse some people as well. I've used this game at nursing facilities and with mentally challenged adults and it goes over well. I've used Sushi go and it goes over well with the rummy crowd. 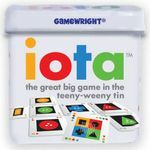 Just played this with my 60+ mother-in-law this past weekend and she liked it a lot. She plays a lot of 500 and Euchre at her apartment building so she picked up on the play of this game fairly quickly. Easy scoring--printed right on the cards--some take that stuff and easy play seem to be geared to the demographic of casual game players. Though you say Carcassonne did not go over much, this smaller tile-laying 2-player game just might be fine. Or you might even consider something like Cities which has more of a Bingo quality. Of course, a smaller Carc variant standalone might be better overall. The issue here is if your grandmother does not like puzzles she probably will not respond well to this at all. 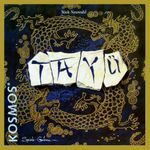 If you can find it, the Kosmos/Rio Grande edition of this game is right up her alley. Easy rules, but very interesting choices. 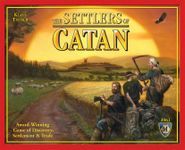 I've never played the red edition - I see they changed the layout of the board, which bothers me, and the pieces are unappealing. The original ivory-colored edition is a beautiful game as well as an excellent game! Given the presence of Qwirkle and Ubongo on the list (i.e. 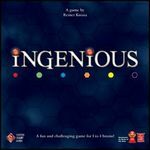 colourful abstracts with simple rules), I'll suggest Ingenious. 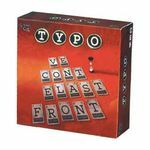 Since Grandma likes card games, she may also like this little gem. Again, the rules are simple and straightforward. If you play with basic scoring, you're essentially trying to collect as many cards as possible in three colours (any three colours) while avoiding collecting cards of other colours. This is another game that might work. Not sure of its current availability. Another press-your-luck game, this time with dice. Is this a more acquirable path-laying game? How does Grandma feel about Zombies? This one is super easy and quick to learn, and it's a fun time. 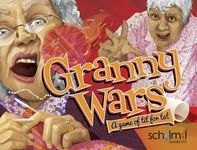 If you can wait for the PledgeMe crowdsourcing campaign to run and production to begin (maybe December 2103), this is a fun Granny-centric game. They even have a pledge level to include a pick our your Granny in the play deck. I avoided adding this the first go-round because it is exclusively 2p. But if grandma can add up to ~ 20 and know if a number is bigger or smaller than another, then she is good to go with this one. Why do I recommend it? 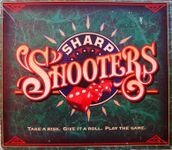 This is a great one that I like to play when I am mentally and physically fried, but still want a game...this one is manageable and enjoyable! This is addictive for some reason. Worth a try since she likes traditional games.